Mark your calendars for Saturday night, June 2nd when the sights and sounds of tractor and truck pulling come to Madison International Speedway presented by 99.9 FM WJVL. Gates will open at 4:00 PM. First pull is at 5:00 PM. “We are very excited about the tractors and trucks coming to MIS again in 2012. This year will feature a slightly different look with Badger State and the Tri County Mini-Rods here,” said MIS General Manager Dave Grueneberg. The current pulling surface located inside the Ring of Fire was installed in 2011 and hosted two nights of pulling. “The response from the guys who pulled last year was pretty positive. We think we have a pretty good venue for pulling,” added Grueneberg. Highlighting the action will be the Badger State Tractor Pullers. Three classes will take to the clay surface inside the “Ring of Fire” including Super Farm Tractor, 466 Hot Farm Tractor, and 4×4 Pro Street Diesel trucks. Super Farm Tractor and 466 Hot Farm Tractor are two of Badger State’s most popular pulling divisions. These are the “Smokers” that will get your heart beating as they take the line to pull the sled. Super Farm features heavy chassis tractors that are allowed to run one limited size turbocharger with a large cubic engine. Their pulling weight is 9300 pounds, diesel or gas but must run the original stock fuel for the make and model. The chassis must be the original equipment only. The engine is a 640 cubic inch with original equipment block, cylinder head and exhaust manifold with a custom intake manifold allowed. In the 466 Hot Farm division, the heavy chassis tractors are allowed to run one limited size turbocharger with a limited cubic inch engine, limited size tires, and unlimited engine RPM. The pulling weight is 9500 pounds with diesel fuel only with the original equipment chassis only. They run a 466 cubic inch engine with original equipped block, cylinder head, intake and exhaust manifolds. In the 4×4 Pro Street Diesel Truck division these 1000 horsepower four wheel drive trucks weigh in at 8000 pounds with a 35 inch tall street legal tire. The truck must have an original equipped engine from the factory in a one ton or smaller pickup truck. Badger State pulls throughout Wisconsin and northern Illinois and can be found pulling at many of our area county fairs this summer. The Tri County Pullers Inc. Mini Rods will be part of the program with their Open Mod, Econo Mod, and Limited Mod classes pulling. 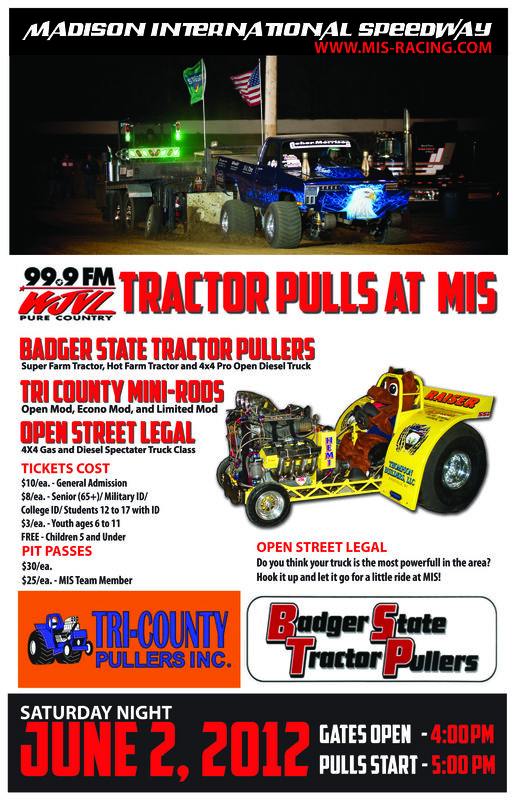 The Tri County Pullers Inc. brings some of the loudest and fastest paced mini-rod tractor pulling in Southern Wisconsin and Northern Illinois to MIS. They are a family based organization pulling at fairs and festivals with the finest built tractors in the nation. The series has three main divisions that will all be pulling at MIS on June 2nd. Two spectator truck pulling classes will also be on the card with an open street legal 4×4 gas and open street legal 4×4 diesel divisions. Participants in this division must have proof of insurance and registration. There will be a limit of 15 trucks in each division. To learn more about Badger State checkout their website at bstponline.org and the Tri County Pullers at tricountypullersinc.com. General admission tickets for this event are just $10.00 for adults.